Waldron’s display is a world class show with small town pride. 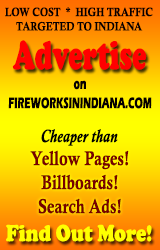 This year’s 30 minute firework show will be synced to music, contain several jaw dropping unique ground display effects, a 200ft waterfall suspended 100 ft in the air, a 32ft x 20ft pyrotechnic flag, several hundred of the biggest shells in the country, a 16” shell that will travel ¼ mile into the sky and can be seen from 80 miles away. In total there will be more than 10,000 individual fireworks in this show!